The world of 3D printing came up as an evolution for “how we create and make 3D objects”. With every new 3D modeling software there came a new revolution on how we design and print stuff. But for this smart world, printing needs to be smarter than smarter. That’s where we talk about the great applications that help you to create and print 3D objects using your handy smart-phones. From Google Play store to iOS store, there are tons and tons of 3D printing apps available. These apps allow the user to control the printing device and make 3D printing easier and innovative. And I’ve come up with the best 3D printing apps available for Android. This app, initially known as Modio was later acquired by Autodesk. Autodesk app lets you create and customize your own design using any 3D modeling software from Autodesk. I personally downloaded this app and trust me, designing has never been so much fun. It is easy to install and operate. You can print your design by transferring the design to your printing machine via Bluetooth or using SD card. Having wireless option is best in the present world as we don’t want to play with sd card often. This app will cost you about $4.13 and give you the control of your 3D printing machine. MD code provides you a greater level of control over 3d printing. You can control the rate of flux to be used and the density of the material to be filled. You can create the supports to your model and much more just at a touch of your android smartphone. If you want to do a 3d designing task with the help of a pen then Ailink 3d doodling pen is a great choice for you. GcodePrintr is a paid app, I didn’t use it personally, but from the reviews on Play Store, the app looks satisfying to me. Many people have mentioned that it’s a reasonable price, considering the features this app provides. From the name, you know this app is a product of Autodesk. Autodesk has many 3D modeling and printing apps online, but AutoCAD 360 is the best to develop any 2D or 3D design on your smartphone. It allows you to work in both online and offline modes, making it a versatile app. Now let’s talk about some cons of this application. It requires high performance and good graphics phones to work smoothly. Using it on my Lenovo K3 note, the phone was hanging quite often. Those having high-performance smartphones with RAM>=3 GB can sure work on this app smoothly. The app will cost you about $4.99- $99.99 range. So things are pretty simple. A good software needs a good hardware for functioning smoothly. This app is available for free, both for Android and iOS. With this app, you can give input to your printing machine directly from your phone and the app notifies you once the printing is done. This app, however, is compatible with MakerBot printing machines alone. So if you are not looking to work with MakerBot machine then there is no use of downloading it. This app is a blessing for your growing up children. The app helps them to bring their favorite imaginations to life. If the can think it, the app helps them to 3D print it. Applications like these help in the child to interact with technology in a fun way and learn new things. This app is available for free in Google PlayStore and comes with 3D printing simulator. So if you are looking to experience 3d printing, you can make a start from this app. Blokify lets the builder create block-based models which can be 3D printed by transferring the G-codes to the printing machine via Bluetooth or through SD card. The limitation with this app is that you can not make intricate objects having curved surfaces or edges. 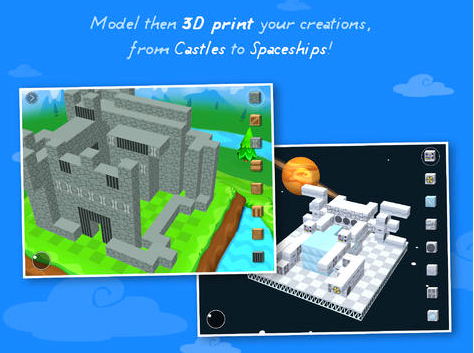 In all, the app is useful for creating creative blocky buildings and objects. The app costs about 270 rupees only. You can download the application from Google PlayStore. Print3D-X60 is an Android application that allows users who have a 3D ProJet X60 type printer to remotely access and control their ProJet X60 printers from anywhere in the world. It provides a detailed activity for each printing steps. With this application, you can start prints, check print status including end time and run diagnostics all from your Android mobile device. The app is available for free on Google PlayStore. There are many more applications available on Google PlayStore, free as well as paid, that can be used to 3D print your design using your android smartphone from any place, anytime. Several companies launch their own apps that are compatible with their own printing machines. In such cases, I’d request you to search according to the 3D printing machine you are using. I hope this article gave you some insight about various 3D printing apps available for your Android device. If have you any questions related to 3d printing then you can ask us in the comments sections.